At this time of year, we are deep into planning for our upcoming turtle season on the field boat and at the Sea Turtle Centre. But our minds are also full of thoughts of the nesting beach. We’re wondering what is happening in those many countries where Canadian sea turtles come ashore to lay their eggs. Last year around this time, a team from the CSTN was down in Trinidad on Matura Beach working with our friends from Nature Seekers. Kayla Hamelin, who is the CSTN’s coordinator of conservation and educational outreach, was one of the members of that team. She kept a record of her experiences in Trinidad that we want to share with you over the next few blog posts. After several months of exceptionally brutal winter at home in Halifax, we stepped out of the airport in Port of Spain, the capital of Trinidad, into a completely different world. After adjusting to the intense humidity, I was struck by the landscape. Even from the arrivals door, a backdrop of dark green, rolling mountains loomed not too far away. A short drive later, we arrived at Suzan’s Guest House in Matura, our accommodations for this trip. The view of the mountains from the sidewalk outside the Port of Spain airport. This has been my first time spending time in a tropical country, and as a biologist I have been struck by the amount of life that is here in terms of both biomass and biodiversity. It is lush and green… and loud! Thick foliage surrounds us and there is a near-constant cacophony of songbirds and cicadas (not to mention the neighbour’s rooster!). I spend time watching small green lizards climb across the cement patio below, and chattering flocks of parrots fly by each evening. I can see coconut, banana, mango and lime trees from our balcony. The view from the balcony at Suzan’s Guest House. But of course the ultimate reason we are here is found a little way outside of the village of Matura at Matura Beach. This is where leatherback turtles haul themselves out of the ocean to lay their eggs. Something that makes field work on the nesting beach different from our work in Nova Scotia is that it happens at night. Typically, in Canada, when we go out on the boat to conduct our research with leatherbacks at sea, we get up very early in the morning and work throughout the day. Instead, here, our work begins after sundown. We arrived in Trinidad after an overnight flight, and although we tried to rest during the day, I was glad to have a boost of adrenaline keeping me alert as we headed out for our first night on the beach. I was really excited to see my first nesting sea turtle. The night began with an introductory meeting with our collaborators from Nature Seekers. The Nature Seekers monitor the leatherback nesting beach and guide eco-tours to see the turtles. After deciding on a game plan for the night, we took an entertaining drive down the twisty, bumpy road to the beach. On top of having to “drive British” (in the left lane, with steering wheel on the right and gear shift on the left), we had to dodge a couple of bold local dogs and, even a loose horse that crossed our path (“I thought it was a moose!” quipped the Cape Bretoner on our Canadian research team). We finally arrived at the parking lot. Bats swooped overhead as we headed down a gravel path to the beach. The beach itself is an amazing sensory experience; the salty smell of the sea wafts over you as incredibly rough surf pounds the beach. The humidity and the sea spray create droplets that are visible in the beam of your headlamp. Behind the sand there is thick forest, and I was particularly struck by the beauty of the arching palm trees silhouetted against the starry indigo sky. We walked for a fairly short distance when our Nature Seekers guide, Randall, said to me: “You’re going to see your first nesting leatherback tonight!” Then he pointed. A massive turtle was just ahead of us in the sand. I would have walked right by if he hadn’t said anything! There are many large heaps of dark seaweed clumped on the beach and the animal’s black hulk blended right in. She was “body pitting,” moving her body around and digging with all four flippers, settling into the sand and selecting the best spot to start digging the nest cavity. Eventually she concentrated on digging the hole for her nest, and then began depositing her eggs. It was incredible. Kayla and her first nesting leatherback turtle. The light near the turtle’s head is red from the headlamps of people nearby. People use red light on the beach instead of white light because it does not disturb the turtles while they nest. Despite two seasons at CSTN on the turtle boat working with dozens of live leatherbacks at sea, this was a completely different experience. I can only describe it as a “circle of life” moment. All of the leatherbacks we see in Nova Scotia begin their lives in a place like this. It was surprisingly emotional to see a nesting animal that had beat the odds to survive to adulthood, and had likely swam thousands of kilometres from her distant foraging grounds to be there that night. Plus, I was witnessing an incredibly ancient process. These animals have been coming up to the beach in this same way for literally millions of years. 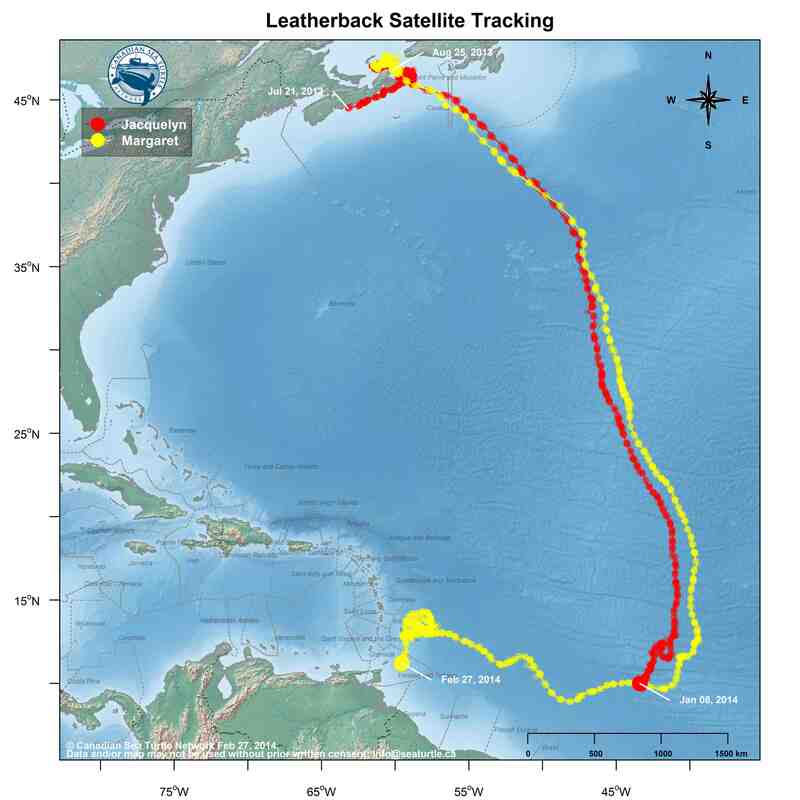 In Nova Scotia, our at-sea field work with leatherbacks is typically hectic. To ensure their health and well-being, we have to work with the turtles very efficiently to return them to the ocean as quickly as possible. But on the nesting beach, things are much slower. It takes leatherbacks about two hours to complete the nesting process. This gives us a lot of time to take in the experience. We do most of our tagging, morphometrics, and injury assessments (“working up” the turtle) while the turtle is laying her eggs, when she enters a trance-like state. After soaking in my first experience with a nesting turtle, we got down to business, working up this turtle, and several others that we found further along the beach. It was a successful first night. We were just checking the data records sent to us by our friends at Nature Seekers in Trinidad about the Canadian turtles they’ve seen on the beach. The records list many things, including the series of numbers on each turtle’s flipper tags. And one of them was Beverly! 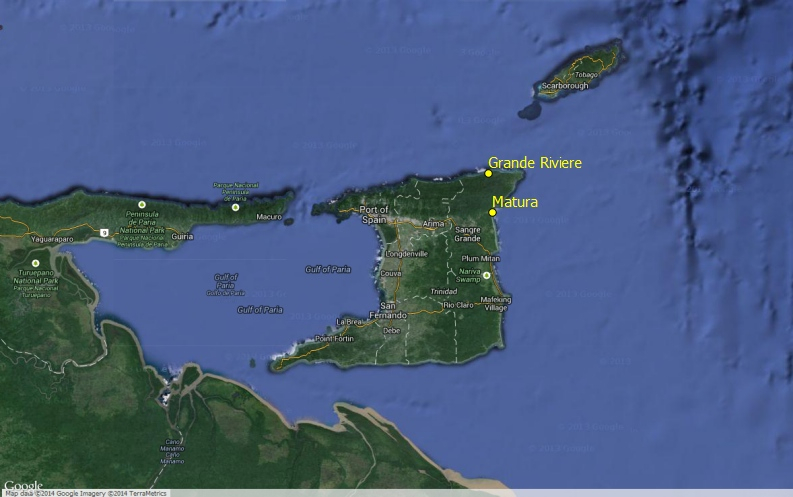 She nested at Matura Beach at 11:48 p.m. on April 9. Beverly was not wearing her satellite transmitter any longer, so she looked like any of the other nesting turtles there. But her flipper tags confirm it was her. I have been lucky to spend time at Matura Beach myself so I have an idea of what it would have been like to watch Beverly lay her eggs that dark night, only a sliver of crescent moon in the sky. But still I wish I’d been there to see that moment when she touched land again after thousands and thousands of kilometres and three solid years at sea. This is a photograph I took of a leatherback nesting on Matura Beach in Trinidad when I was there in May 2014. This turtle, like Beverly, came ashore after an incredible journey. Jairo weighs a hatchling leatherback. 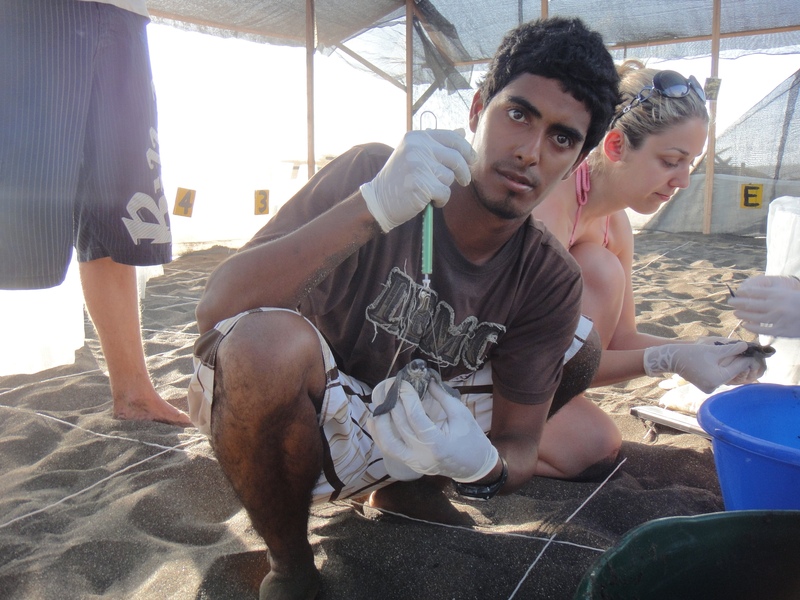 In 2012, according to The Tico Times, Jairo and his colleagues on Moín Beach saved 1,474 sea turtle nests. In 2013, poachers stole the eggs from all but eight. Photo: Christine Figgener, Courtesy of Wikimedia Commons. 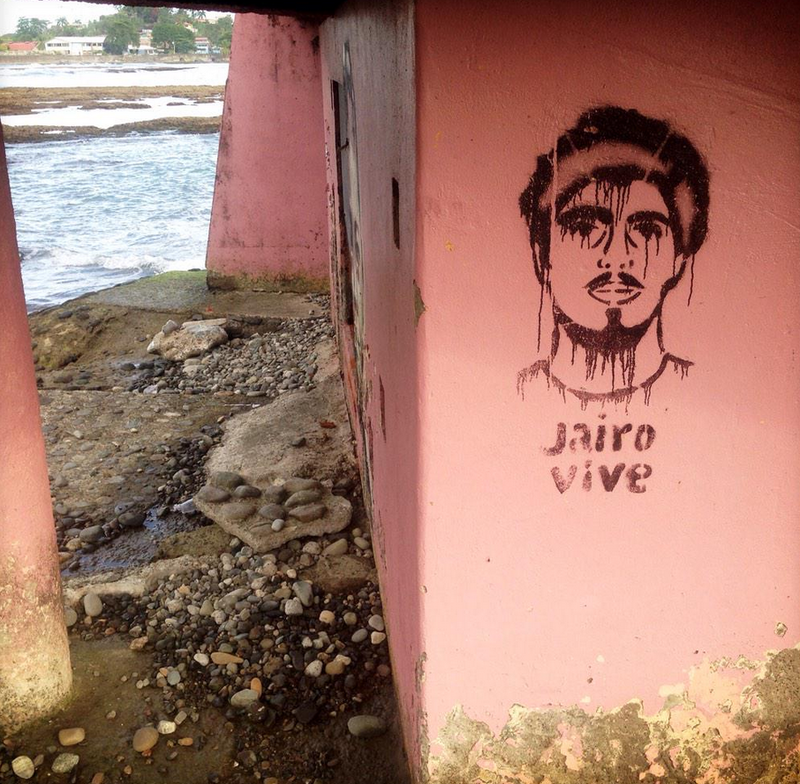 Sometime after 10:30 p.m. on May 30, 2013, Jairo Morra Sandoval was murdered on a Costa Rican beach. Jairo, who was 26 years old, protected leatherback turtle eggs and was killed for it by a particularly violent group of poachers. The Tico Times outlines the “delays and blunders” in the trial in this article. Both this piece by The Tico Times and this piece in Outside Magazine give background on the story. This story is distressing and sad. Jairo had been working with sea turtles since he was a little boy. He released his first leatherback turtle hatchlings when he was six. He was on the front lines, trying to keep leatherbacks safe. As the beach became more dangerous and after the local police force cut back their security detail, Jairo used to call his mother for a blessing before he went on patrol. I can’t tell you the number of times I’ve stood in front of groups of people and listed off “poaching” as one of the threats to the survival of leatherback turtles. People stealing the eggs, which are worth about $1 each on the black market. But it’s hard to explain what it takes to stop it. I think of my friend Suzan Lakhan Baptiste of Nature Seekers who stood unarmed on Matura Beach in Trinidad, staring down poachers with machetes, ordering them to stay away from the leatherbacks and their eggs. Now virtually no leatherbacks are poached on Matura Beach anymore. 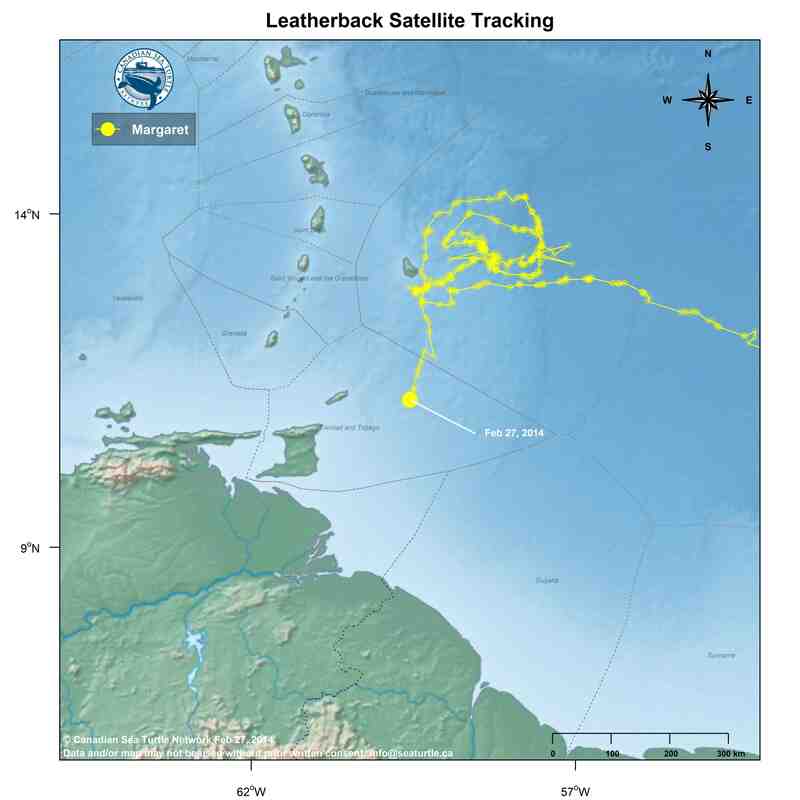 Canada is in a unique position when it comes to leatherbacks. Turtles from the nesting colonies throughout the Caribbean come to Atlantic Canada to feed on jellyfish each spring, summer and fall. I often say that we’re like the United Nations for sea turtles.